Our Hawk Tie Stickpin measures 11mm x 55mm and weighs 1.8g in Sterling Silver, 2g in 9ct gold. Our Hawk Tie Stickpin can also be set with diamonds. Pictured here in 9ct gold and diamond, this tie stickpin is available to order, priced at £350. Our Hawk Lapel Stud measures 14mm x 11mm. This Lapel Stud weighs 1.5g in Sterling Silver, 1.7g in 9ct gold. The face of our Hawk Seal Style Signet Ring measures 13mm x 12mm. Our intricately handcrafted Hawk Brooch features very fine detailing. Our Hawk Brooch measures 32mm x 27mm. This Hawk Brooch weighs 7.3g in Sterling Silver, 8g in 9ct gold. Our Hawk brooch is available in Sterling Silver, 9ct gold or 18ct gold, and can be set with any precious stones as desired. Please call us or email us and we will be happy to discuss your ideas to personalise your gift. 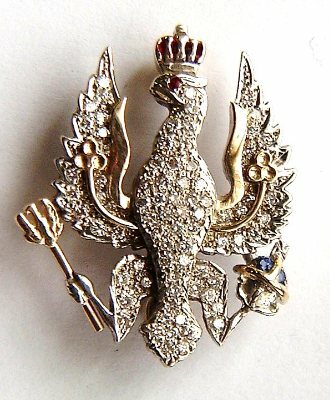 Pictured here, our Hawk Brooch is set with diamonds, a ruby, sapphires and enamel to the crown. Please call us or email us for availablity and dispatch times. Our Hawk Cufflinks measure 18mm x 14mm. These Hawk Cufflinks weigh 9.1g in Sterling Silver, 10g in 9ct gold. Our Hawk Kilt Pin measures 27mm x 55mm and weighs 11.9g in Sterling Silver, 13g in 9ct gold.